Now...I want them all!! E.l.f. 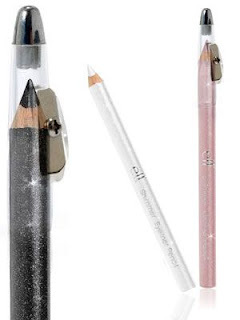 Shimmering Eye pencils! Hi ladies! I know the title is that of a maniac obsessed with makeup, always makeup BUT I have a good reason for that! This morning I've gone to university with a simple look that included a bit of mascara and...E.l.f. Shimmering eyeliner pencil in black bandit (with silver sparkles in it)... As soon as I've applied it..I fell in love! WHAT ELSE?? I mean, is there anything in these pencils that makes them not worth a try? I don't think so! These are currently out of stock on the UK/EU/IT website, but they will be restocked in a few weeks or less. I think they are a great Christmas present too. Have you already tried them? Let me know! Ma che carina, davvero un bell'effetto sull'occhio. queste matite sembrano proprio ottime, speriamo che ritornino presto sul sito! Che bel colore. Mi piace molto l'effetto che dona all'occhio.